When a copper penny is zinc plated it will appear to change from its copper color to silver color. And by using sufficient heat, a zinc plated copper penny can be changed to gold. 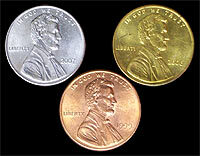 This version of Silver and Gold Pennies utilizes zinc sulfate as less caustic than sodium hydroxide and works as well. Fill the small 50 mL beaker with 3/4 full tap water. This is your rinsing beaker. Set aside. Dissolve 1 oz (30 g) of Zinc Sulfate in 100 mL of water in the 250 mL beaker. A little heat from setting on the hot plate will hasten this dissolve. Place mossy zinc pieces in the beaker with the zinc sulfate solution, enough pieces to almost cover beaker bottom. Using tweezers, place two or three cleaned up pennies in step three beaker making sure pennies touch the mossy zinc pieces and are not touching each other. Bring solution to low boil for about 10 minutes. Your pennies will slowly turn a silver color. Using tweezers, carefully remove the pennies from the solution, rinse and cool them in small wash beaker then dry them on a paper towel. Voila! You now have a dandy silver colored penny. Place the silver penny on a hot plate heated to about 570F (300C). Watch as the heat diffuses the zinc with the copper to form a brass alloy. This will appear as golden in color. Once the penny is a brassy/golden color, use tweezers to pick up the penny and transfer it into the wash beaker to rinse and cool. Once cooled, you have a nice gold colored penny!